After the India Couture week, rolled up, where my eyes could not wander beyond current trends,and how our Indian designers didn't leave variations behind in their creations, and gave us a lot to experiment and food to digest, I picked up Inspirations, from where they left. We are blending trends like never before,and there are transformations of style over fashion-Read Street Styles ! 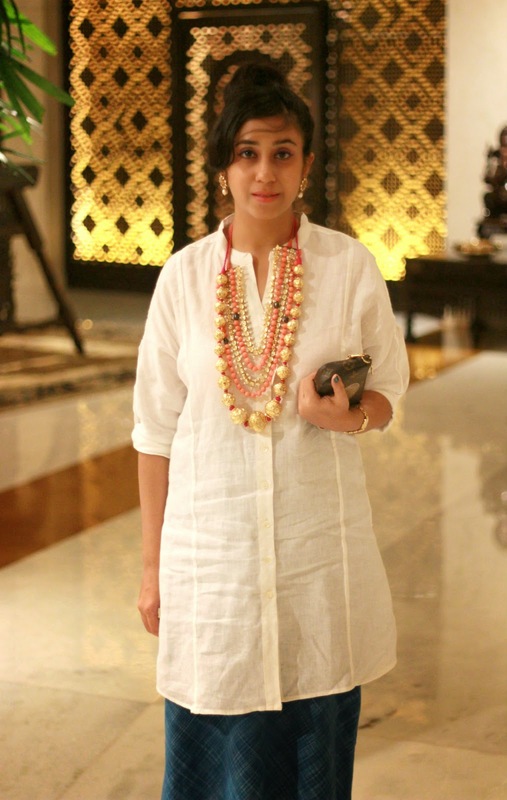 I have been drawn to wearing lots of neutrals, and whites,this summer season, and it was then my eyes fell on this Kurta dress by Fab India. I was in the trial room, wearing these same slip-ons, and felt that they could effortlessly help me create a concocted style, which I had so long in mind. 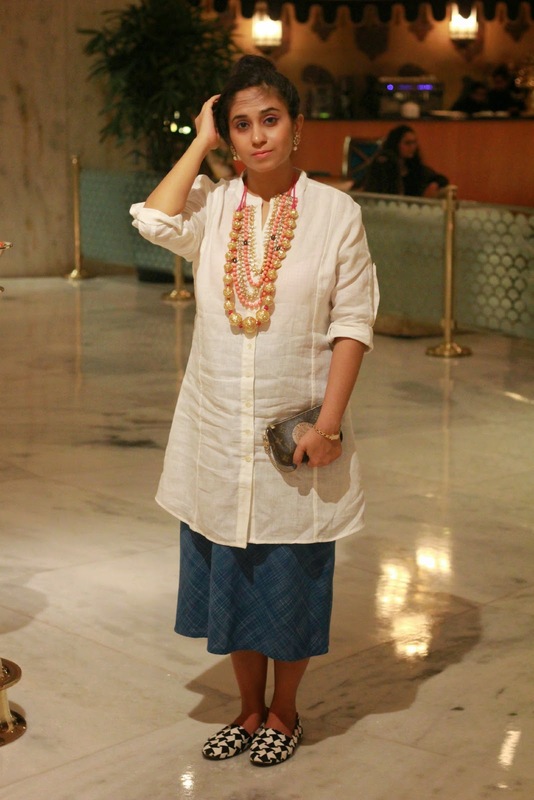 Later after much of searching and hunting around the racks, I found this cotton midi skirt too, in the fabric that always set my monsoon mood and I was ready to deliver any indo-fusion "Mien" ! Stacking Jewelry Pieces is a great idea , especially if you are experimenting with Indian Jewels as they Scintillate a heavy duty fashion Armour . 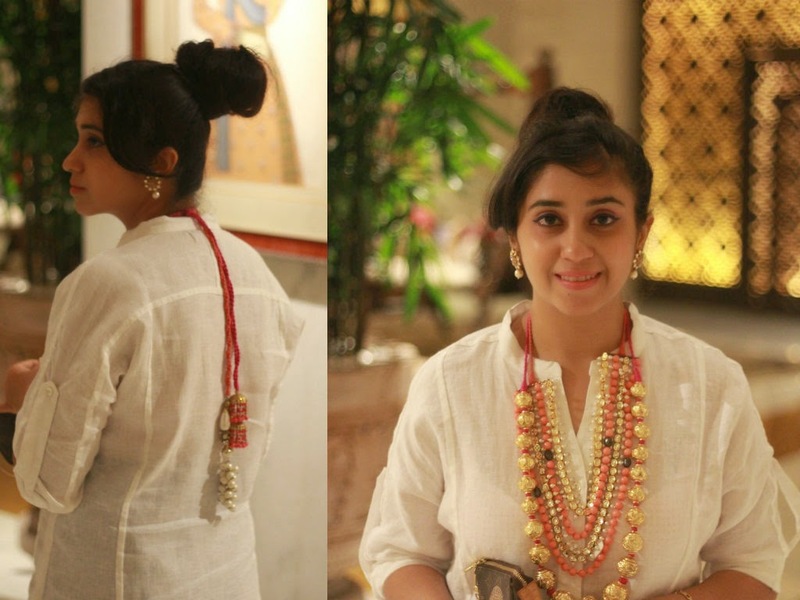 I used elements of Kundan, in this Maharani style 3-tiered necklace, and then added the beaded balls necklace to get to a modern version of Indian Wear staples. The back had some elaborate Latkans, which not only brought my opulent fantasies to fruition, but pretty much made me stand out, amongst the great sea of Accessories ! The dress is absolutely beautiful! And I love your hair style, you look lovely! A houndstooth slip-ons & pearl + gold jewelry....totally a head turner...great look! Very cool and well thought out outfit ! Loved it . Thanks for your comment on my blog. Like the shoes, houndstooth is one of my favourite prints. What an innovative outfit! Love the necklace.. 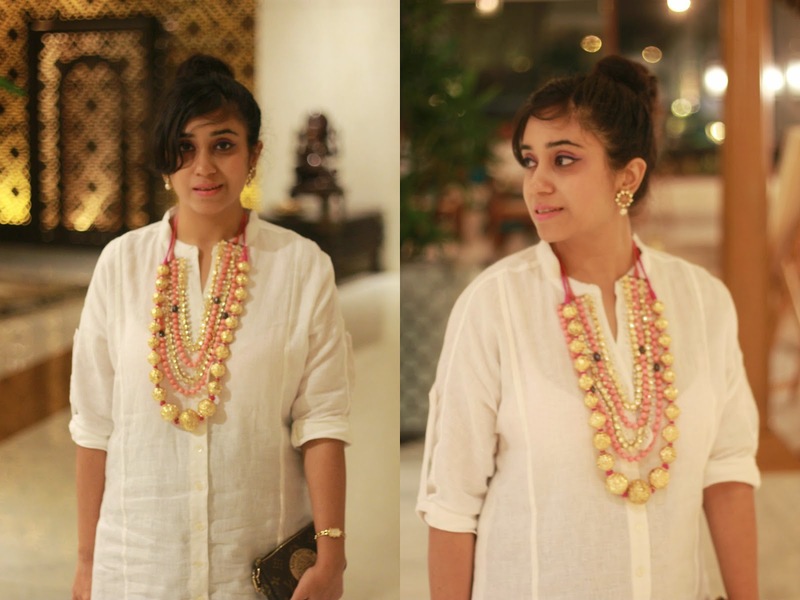 I adore the necklaces you are wearing, they work beautifully together! Great post, thanks for sharing - you look gorgeous!! The layered beaded necklaces are so pretty! Hope you're having a great day! 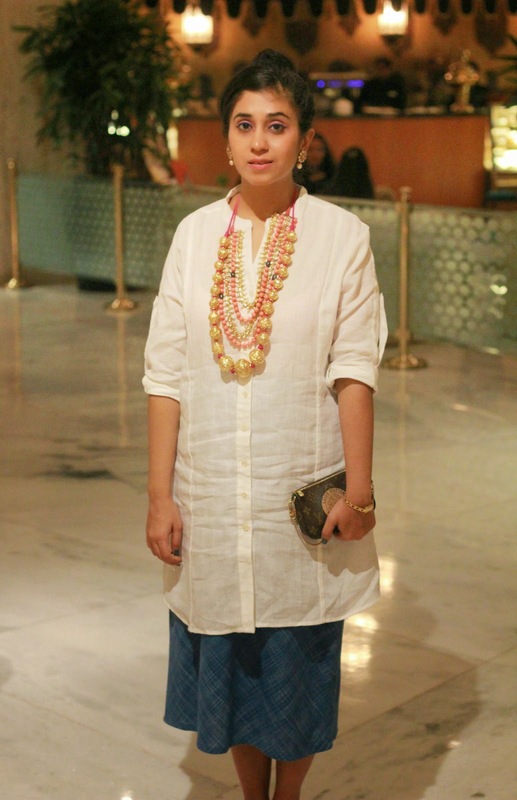 An effortlessly chic look, love the statement necklace and cool houndstooh flats ! this is such a fun look! love the necklaces! You look so beautiful! I really love your outfit, look amazing on you! Great necklace! Love your hounds tooth printed shoes & thanks for stopping by! Wow, what a cool necklace! I'm totally charmed by your shirt and necklace! You truly inspire me with this outfit. Beautiful.